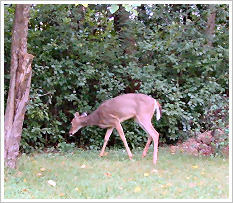 One morning, an urgent call came in to the Wisconsin Humane Society Wildlife Rehabilitation Center from a Greenfield resident who was concerned about a deer that was hanging by one leg from a fence in his neighbor’s back yard! 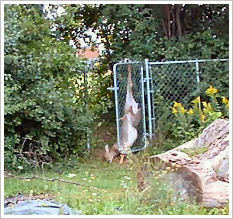 When WHS Wildlife Manager, Scott Diehl arrived at the location, he found Veronica, the deer, highly stressed and nearly exhausted, hanging by one hind leg with her foot stuck in the wire mesh at the top of the six-foot-high fence. 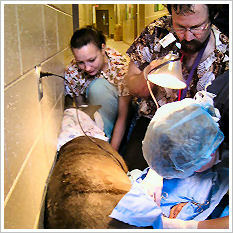 Scott quickly prepared an anesthetic injection, and gave her a shot. In a few minutes, the deer had relaxed enough so that Scott was able to release her trapped leg from the fence, and she stumbled forward a few steps and collapsed on the grass. He quickly examined the deer in the field, and found her to be in good condition, except for a laceration down her hind leg, caused by the fence. Scott rushed her back to WHS where they were met by WHS wildlife rehabilitators and veterinarian Dr. Jane Pohlman who stitched her wound with about 40 dissolvable sutures. She also received an antibiotic and a pain-numbing injection. Back at her release site, Veronica received an injection to reverse the effects of the tranquilizer and within a few minutes, she got to her feet, still a bit wobbly, and walked away. We hope she is now a much wiser and fence-wary deer. Your support of the WHS Wildlife Rehabilitation Center helps make rescues like Veronica’s possible.